Today we showcase an exciting and a successful venture founded by, Tim Moreillon from, Geelong, Australia, NetDefence. Out of school I worked in the car industry for 8 years, doing everything from sales to IT to administration to compliance to management. I felt like a change after this and decided to focus my attention on the Information technology field. My interests include music, cars, photography and of course, technology! NetDefence helps businesses protect themselves from technology threats. We go out to the market and find the best of breed solutions for our clients and ensure they and their staff can use the Internet and be shielded from malicious threats, scams and fraud. We also help businesses meet their compliance needs. As legal responsibilities for e-discovery and employee safety increase, NetDefence can help businesses ensure they have these areas covered. NetDefence was started by Kelvin Benson and Tim Moreillon. We have been working on developing the business and identifying the products that suit our clients since January 2008. We spent 6 months researching security solutions and planning. We tested many solutions and came up with the best for our clients. As small to medium businesses have not traditionally had the resources to adequately manage their IT systems, we aim to assist them by managing this responsibility on their behalf. We aim to remove the fear around technology and give 'big business' tools to small business. NetDefence provides managed online solutions to take care of technology threats and compliance. We assist businesses in understanding technology threats and their responsibilities towards them. We aim to educate people and help them see technology as a positive, rather than a burden. Mostly small to medium business, although we have some larger clients too. The solutions we provide are used by thousands of people worldwide and have been used in production for over 7 years now. We find word of mouth to be the most successful form of marketing for us. 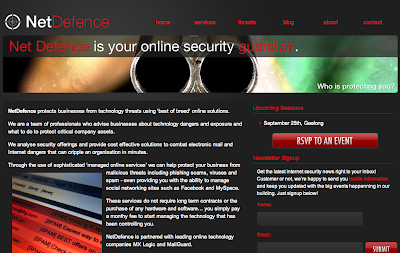 We maintain our website at www.netdefence.com.au and have offered seminars discussing Security. We have also utilised direct mail pieces and personalised letters. We use and recommend Managed Online Solutions. This is our term for what is generally known ad Software-as-a-Service (SaaS) or Cloud Computing. All functions of a program are hosted and managed online and don't require investment in hardware or software. These solutions mean lower cost, better reliability and easier management for end users. As we promote SaaS or Cloud Computing solutions we use them exclusively. We use Salesforce.com.au as a customer CRM and Google Apps for email, calendar and document creation. Due to the online nature of our business we can operate on any OS. Starting a business in Australia at the moment can be tough, especially with the downturn in the world economy. However, if new businesses are smart with their overheads and are confident in their product then there is a big opportunity out there! I like to attend business groups in Geelong and Melbourne to speak with other business people and see how they go about things and to learn from them. There are several technology meet ups I like to go to each month as well. Don't be afraid to try! If you try something and it doesn't work, learn from it, refocus and try another again! Thanks Tim for sharing your thoughts with us. All the best for future.